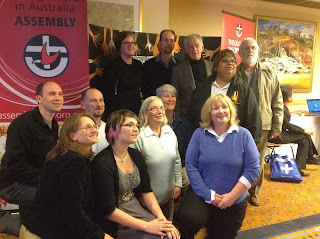 The 13th Assembly of the UCA, held for a week in July in Adelaide, included ten Deacons - five from SA and five from the other Synods. This is more than on previous occasions, so we celebrate about the involvement of Deacons including Denise Champion and Dean Whittaker with Uniting Aboriginal and Islander Christian Congress, Susan Doughty as a Deacon candidate, and Sandy Boyce and Michelle Cook serving as two of the President's chaplains. The UCA Assembly meeting formally acknowledged the 20th anniversary of the renewal of the diaconate, with the first ordinations in 1992 (starting with Betty Matthews in WA).